Keyhole sand dollar Echinodiscus sp., copyright Ria Tan. Contains: Arachnoididae, Clypeaster, Fibulariidae, Laganidae, Neolaganidae, Mellitidae, Scutellidae, Echinarachniidae, Dendrasteridae. 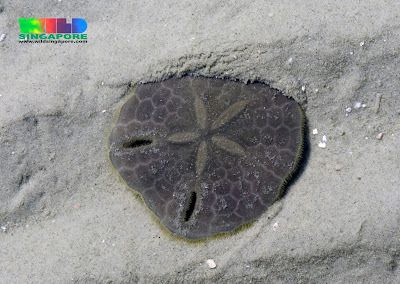 The Clypeasteroida, sand dollars and sea biscuits, are a group of flattened irregular echinoids that are found on or just beneath the sediment surface in sandy or muddy habitats. They can be divided between three suborders; in the Clypeasterina there are two enclosed sphaeridia in each ambulacrum near the peristome, and the Aristotle's lantern has small internal wings and paired supports on the ambulacral basicoronal plates, whereas in Laganina and Scutellina there is only a single enclosed sphaeridium in each ambulacrum, and the Aristotle's lantern has well-developed internal wings and single supports on the interambulacral basicoronal plates (Mooi 1989). Characters (from Durham 1966): Test ovoid to flattened, with petaloid ambulacra as wide or wider than interambulacra on oral surface; genital plates fused; primary tube feet respiratory, restricted to petals; accessory tube feet numerous, extending outside petals, sometimes reaching into interambulacra; peristome small, no gill slits; lantern without compass, teeth without lateral flanges; test usually with internal supports; spines small, short, numerous, of two types; pedicellariae tridentate, ophicephalous, triphyllous, and globiferous.